Several bloggers whom I respect — and dozens of modelers across the interwebs — have worked themselves into quite a tizzy these last few weeks. It all started with Kitty Hawk’s release of their Su-17, Doogs’ Models comprehensive build and review of the kit, and the conversations that followed. I was tangentially part of the conversation sharing Paul Cotcher’s thoughts on the kit as part of my Other Voices series. In case you’ve been asleep these last few weeks, here’s a summary of the conversation. Some modelers, such as Paul, are thrilled to see the KH Su-17 because it represents an improvement over the old KP kit that was produced more than 20 years ago. Other modelers, such as Matt over at Doogs’ Models, are critical of KH for many engineering shortcomings that make the model difficult to build. Modelers seem to be falling in line with one or the other camp and, as in all things remotely political, I find myself somewhere in the middle, which positions me to be The Voice of Reason in this mess. Here’s the thing. I think very highly of rivet counters, really I do. In fact three years ago I wrote about how I learned to love them. People like Matt provide a valuable service to the hobby by digging into new models to assess their buildability, and other modelers are quick to assess new kits for their accuracy and share their thoughts on sites like Hyperscale, ARC, and Missing Links. I remain impressed that modelers — total strangers, mind you — will invest a significant amount of time to help the rest of us make informed buying decisions. Every one of them should be commended. I also have great affection for casual modelers, people who are content to have a reasonable representation of a favorite subject, even if it requires significant modeling mojo to build or if the model is somewhat inaccurate. My “godfather” in the hobby, a man I met more than 30 years ago, has an almost childlike enthusiasm for the hobby and could care less about accuracy. When I feel myself getting bogged down in the hobby, struggling with a model or obsessing over the accuracy of small details, I'll call him and his spirit immediately renews my own enjoyment for what we do. Mind you, this is a man who scratchbuilt a Spitfire wing out of playing cards after he bought a model and found that a wing was missing. Who among us would do that in today’s world? I don’t blame Matt, rivet counters, or other bloggers for this or any other hubbub (have you seen related conversations about the Airfix 1/48 P-40 or the Z-M F-4?). I blame the rest of us. You see, the frustrating aspect of internet conversations is the need that most of us feel to comment on everything we read that we disagree with. Facebook and blogs like this make it easy — even enticing — with those little Comments boxes, and many of us are absolutely compelled to share our thoughts. 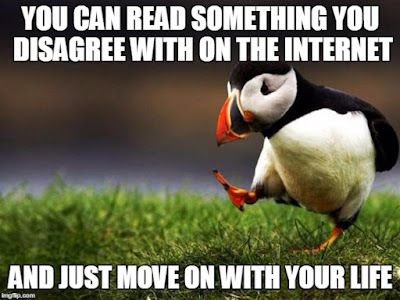 But here’s the thing…just because I can comment on a post doesn’t mean I should comment on a post. Believe me, I see plenty of things online that I want to comment on, but I continually remind myself that it’s okay to remain silent, to hold my opinion to myself. To be fair to all of us who participate in these forums and Facebook, internet conversations generally mirror the conversations we have face-to-face. When I talk to my friends on the phone we chat about the same topics I see online — the prices of kits, judging at contests, whether the KH Su-17 is worth what appears to be inevitable frustration. I guess if those topics are fodder for in-person conversations, they should be for online conversations as well. "Your opinion, while interesting, is irrelevant."